Massage Cedar Cream Balm, with Chaga, 30 ml. Analgesic massage cream, made of 100% natural ingredients. It reduces painful feelings during the massage and suitable for the treatment of injuries, sprains and inflammatory processes, helpful in case of poor muscle tone. 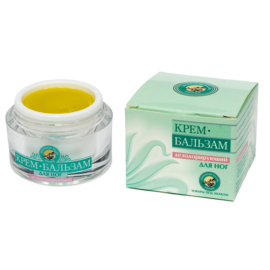 Cream intensely nourishes skin cells and promotes their rapid recovery, has a tonic effect. Chaga mushroom helps to relax muscles and relieve spasm; it improves metabolism in the body and has a relaxing effect on nervous system. Resin in combination with mountain mumie gives a strong antiseptic and anti-inflammatory effect, relieves irritation, treats acne and allergic rash, soothes the skin. Ingredients: beeswax, Siberian cedar resin, chaga mushroom, mumie, propolis, essential oils (cedar, wheat germ, grape seed, grapefruit and sea-buckthorn). Analgesic massage cream, made of 100% natural ingredients.